Because commercial water chillers are expensive, many hobbyists consider constructing their own homemade units. While it's possible to build a homemade water chiller for a fraction of the cost of a store-bought device, such a project is beyond the skills of most casual hobbyists. Additionally, the endeavor can be dangerous to both hobbyists and the tank life. 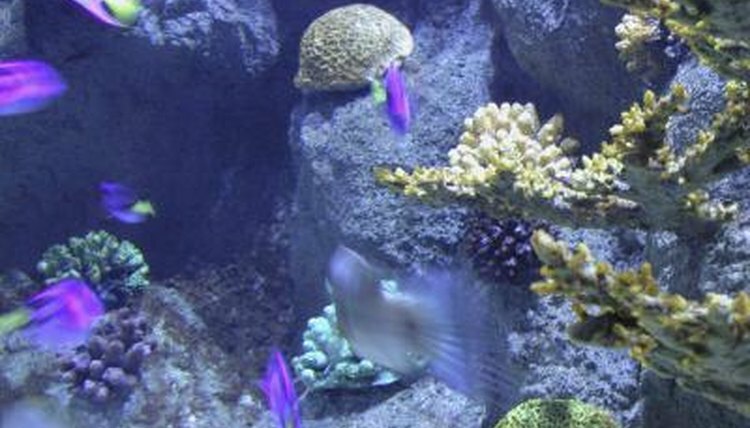 In addition to the heat generated by filters, skimmers and sterilizers, most reef tanks require substantial lighting fixtures that further elevate the water temperature. Many hobbyists use water chillers to moderate these high temperatures. While a variety of styles exist, most homemade chillers are in-line units that draw water from the tank via tubes or pipes, cool the water and return it to the tank. In such a system, the water cools as the heat flows from the water to the cooling unit -- the water is not actively cooled, but rather the cooler serves as a heat sink for the water. Whether commercially produced or custom-built, an effective water chiller can mean the difference between a vibrant reef tank and one that struggles to survive. Most hobbyists use one of two basic approaches to constructing a homemade water chiller: repurposing an existing commercial product or building a cooling unit from scratch. While some hobbyists attempt to use a small refrigerator to chill water, these units are not capable of significantly cooling the amount of water in a large reef tank. Often, the constant use causes the refrigerator’s motor to burn out quickly. Air conditioning units are usually capable of removing more heat from the water per unit of time than refrigerators, but require the construction of a watertight plastic or glass box around the cooling coils of the unit. Building a unit from scratch is possible, but it requires extensive knowledge and expensive tools to accomplish that are beyond the reach of most casual hobbyists. The biggest advantage to constructing a custom water chiller is the reduced cost -- commercial chillers designed for large aquariums can cost thousands of dollars. Additionally, you can construct such a chiller to match your exact aquarium set-up, instead of having to cope with the configuration of a commercial model. However, constructing a chiller is not an easy task, and many hobbyists find they're unable to produce a functioning unit. Even among hobbyists who construct working units, homemade chillers rarely lower the temperature of the tank more than a few degrees. Another problem that DIY hobbyists face is adequately protecting the coils of the system from the saltwater. If the sealant cracks or fails, water can contact the metal, which can be detrimental to the health of the tank inhabitants. Care is required whenever combining water and electrical appliances to avoid the potential for electric shocks. Modifications to electrical components should only be carried out by those qualified to do so. Water chillers are not the only way to cool the water in an aquarium. Some hobbyists use evaporative cooling to keep their tanks from overheating. Liquid water draws heat from your aquarium as water evaporates from it. The easiest way to increase the amount of evaporative cooling is by using a screen lid on your aquarium and blowing a small fan over the top of the tank. For additional cooling, you can incorporate an air stone in the tank. In an emergency, you can use a spare aquarium pump and several feet of clear tubing to pass water through a bucket of aquarium-safe ice water. Though this is not a long-term solution, it's an easy, affordable and safe strategy for brief periods.